When the Madewell x Food52 collection came out a while ago, I very nearly spent 30 bucks on these wooden spoons just cause they're so dang cute. I snapped myself out of it just in time and realized they'd be super easy to recreate. These take minimal effort and just a few supplies but the payoff is huge! I love them! And they are the perfect gift for a housewarming, birthday, Mother's Day, or pretty much anything! Or you could just hoard them all for yourself. No judgement. Hope you make 'em! 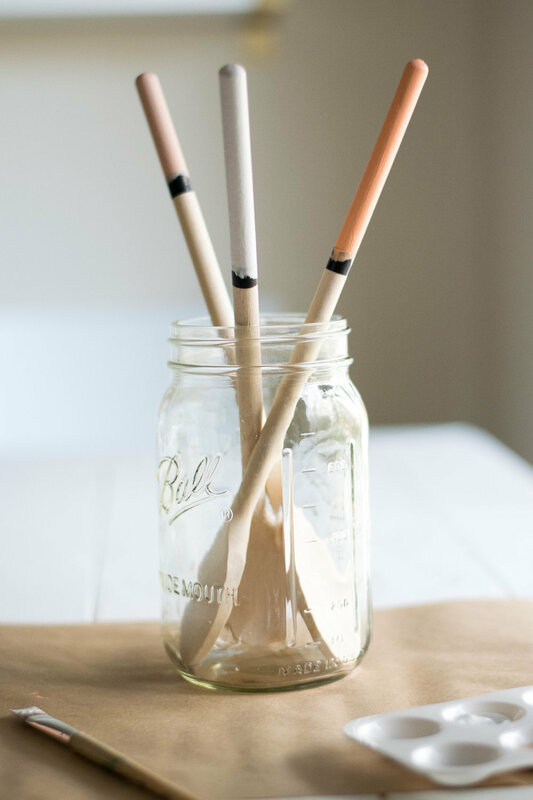 Decide how much of the spoon handle you'd like to paint and wrap a piece of tape around the handle to mark the spot and prevent paint from bleeding onto the part you want left bare. Using a thin coat of paint, evenly paint all around the bottom portion of the handle. Place upside down in the mason jar to dry. Apply a second coat and allow to dry completely before removing tape. You can repeat as many coats you like until you reach the desired opacity. Voila! *I recommend hand-washing these little guys to help the paint last longer.